Mahatma Gandhi once said that “action expresses priorities.” Hearing this quote made me think about the items on my list that I have been putting off for quite some time, and after reading Matthew 5:16 one special goal of mine immediately came to mind. #14. Perform an act of kindness every day for a year. I have heard many people talk about “random acts of kindness,” but I would much rather leave out the word ‘random’ in hopes that it will bring more consciousness to my living and teach me to give more sincerely. Attempting this challenge by no means suggests that I will limit myself to only one act of kindness per day. Instead, I intend to practice kindness the best way that I know how; in teaspoonfuls, bucketfuls and floods, week after week. We were made to enjoy God with overflowing praise, so what better way to simultaneously praise and enjoy Him than by serving his people. We delight to praise what we enjoy because the praise does not merely express but completes the enjoyment. Because the task is so daunting and requires infallible persistence, I am confident that this challenge will also lead me to a joyful dependence on God’s help. Regardless of whether you attempt to do this every day, my hope is that you all will join the pursuit of good deeds, acts of generosity, works of kindness, and ways of love, not just in your day-to-day motions but in your attitudes and your motivations as well. The truth is that your life is one big advertisement of who you are and what you stand for, so be sure to give without hesitation, lose without regret, and acquire without spite. 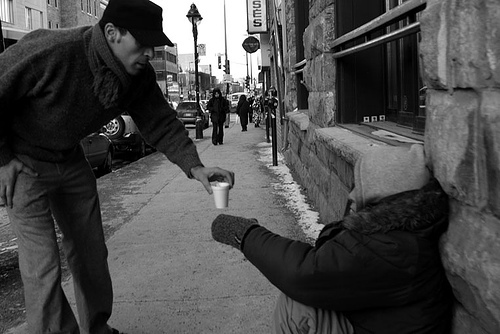 Wherever there is a human being there will also be an opportunity to serve someone with kindness. The power of kindness is immense. Really, it is nothing less than the power to change the world.